All our Schools are situated in safe, well maintained, happy and stimulating environments ideally suited for the academic, social and physical development of children. There are separate playgrounds for children of different ages. The classrooms and playgrounds are designed to enhance learning with visual stimuli and are continually equipped with toys and educational equipment. We have fully equipped and purpose equipped rooms for art, music, English language and Computer technology. 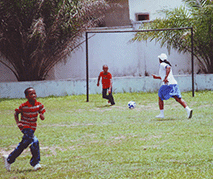 Playgrounds equipped with recreational toys to enhance the pupils’ cognitive development. Three bore-holes to ensure safe and regular supply of water.